CHICAGO -- Scott Foster thought it was going to be just another night. 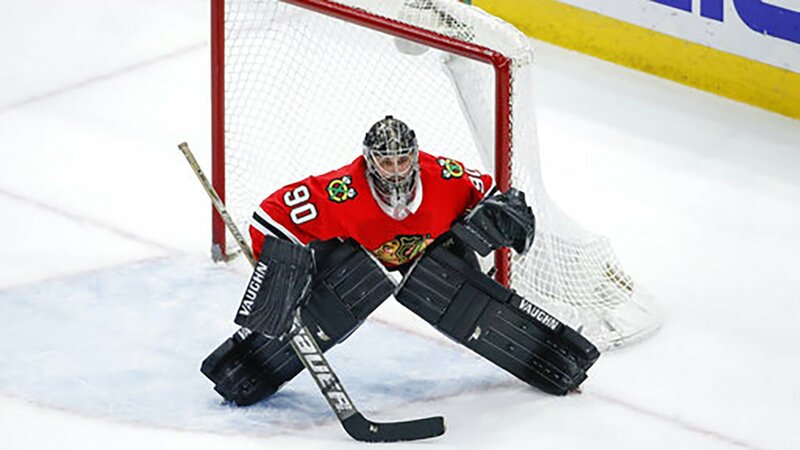 Then the 36-year-old accountant signed a contract, put on his goaltender gear and waited in Chicago's locker room. Then he got into the game. "What a moment," Blackhawks coach Joel Quenneville said with a chuckle. Forsberg was expected to start, but he got hurt during a "pregame ritual," according to Quenneville. Delia, who was just recalled from the minors Wednesday, then stopped 25 of 27 shots in his NHL debut before he was helped off the ice with 14:01 left after he cramped up. "The initial shock happened when I had to dress. I think you just kind of black out after that," Foster said. Backed by chants of "Foster! Foster!" and more loud ovations, he made another stop on Myers and turned away Paul Stastny and Dustin Byfuglien in the final minutes. When it was over, the Blackhawks poured onto the ice and mobbed Foster in the net. "He was great," defenseman Brent Seabrook said. "I think the boys were doing whatever they could to help him out. He made some big saves. Fun night." "It's tough for anybody to come in 50 minutes into a hockey game, let alone a guy who hasn't played in the (NHL)," coach Paul Maurice said. "A great moment for him." The NHL adjusted its rules last summer to mandate that teams have an emergency goalie present for all home games ready to fill in for either team - setting the stage for Foster's most competitive action since 20 minutes in relief with Western Michigan University in the 2005-06 season. "A few hours ago I was sitting on the computer typing on a 10-key, and now I'm standing in front of you guys having just finished 14 1/2 minutes of NHL hockey," he cracked. It was a wild finish to one of Chicago's best performances in a lousy season. Tomas Jurco scored a career-high two goals in Seabrook's 1,000th regular-season game, and touted prospect Dylan Sikura had two assists in his NHL debut. Patrick Kane, Alex DeBrincat and defenseman Erik Gustafsson each had a goal and an assist, and Brandon Saad also scored. "It wasn't a good night," Little said. "It wasn't good from the start. It's one of those games you want to forget and put behind you and look to the next one." Kane got Chicago off to a fast start when he shot it between Comrie's legs for his 27th goal 3:44 into the first, and the Blackhawks just poured it on from there. Saad made it 2-0 with a nifty move to his backhand in front at 17:17. NOTES: Quenneville said Delia was going to travel with the team to Colorado and should be fine for Friday night's game against the Avalanche. With four games left in the season, he said Forsberg (lower body) is likely done for the year. Jean-Francois Berube was recalled from Rockford of the AHL on an emergency basis.